A woman has warned of the dangers of looking at phones while crossing roads after being hit by a vehicle in a suspected hit-and run. Olivia Keane, 20, was knocked unconscious while walking across Butts Road in Wellingborough, Northamptonshire, on New Year's Eve. Police believe she was hit by a vehicle that failed to stop. Miss Keane cannot remember the details, but believes she was looking down at her phone at the time. The personal trainer said: "If I was on my phone and crossing the road I know I'm partly to blame, and also you never know what idiots are going to be driving around. "[Looking at your phone] is not worth it in the slightest. "Just wait until you get home or wait until you've crossed the road, at least. "I've definitely learned the hard way." Miss Keane was walking home from her girlfriend's house to pick up clothes for a trip to Brighton, where they planned to spend New Year. 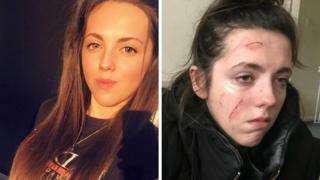 She said she was crossing Butts Road at some point between 12:30 GMT and 13:20 when she "felt a really sharp blow to my side and I remember feeling the pain and shock of it". "The next thing I remember I was lying on the floor and having a banging headache," she said. Miss Keane returned to her girlfriend Amy Gray's house and was then taken by ambulance to hospital, where she was told she was "lucky" not to have broken any bones. She had suffered severe pelvic and rib bruising and cuts to her face and has had to take time off work during her "busiest time of year". Miss Keane said the driver who fled the scene "needs to have a bit of a wake-up call". "If it was a young kid or elderly person they would have been much worse than I was," she said. A police spokeswoman said: "It is believed the woman was knocked unconscious after being in collision with a vehicle that failed to stop, and she may have been at the roadside for several minutes before regaining consciousness."